IPA No. 1 (5.8% ABV): IPA, or India Pale Ale, is a style that I had not seen brewed truly gluten free before. It was also one of my favorite styles before being diagnosed with Celiac Disease and Harvester didn't disappoint. Piney West Coast hops dominate the aroma and flavor. Great color, head and lacing. The addition of tapioca maltodextrin gives the beer extra body. The hops and citrus are balanced by the roasted chestnuts. Pair this hoppy beer with spicy dishes or pizza. Pale Ale (5.8% ABV): The Pale Ale pours light and fizzy with some sediment towards the bottom of the bottle. The earthy taste from the chestnuts is followed by a decent bitterness from the hops. Light roast and grassy citrus are also present. This Pale Ale reminds me of a similar style from Glutenberg. The beer can be paired with just about anything, especially grilled meats. Dark Ale (4.5% ABV): Harvester uses dark-roasted chestnuts for this ale, giving the beer chocolate and coffee flavors. Nicely hopped, it has a pleasant, nutty bitterness that balances out the sweeter side. This beer is closest to an American Porter in style. An all-around enjoyable, complex beer. Try this dark beer with steak and garlic mashed potatoes. 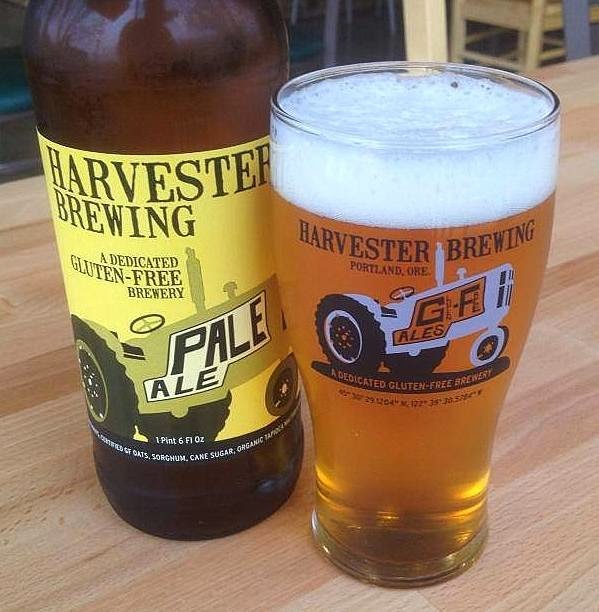 Harvester beers are currently sold in Oregon, Washington State and Vermont and can be ordered online, although shipping is not currently available to Pennsylvania, New Jersey or Delaware residents.